DAF-Hughes widened the scope of the DB250 chassis, allowing bodies other than the Optare Spectra to be built upon it. Demonstrators were built with Northern Counties Palatine II bodies. Metrobus had one in May 1995, and used it on the 261, operating from the Green Street Green base for about six months. They applied house colours of blue and yellow in bands onto the dealer white, with a large fleetname between decks. Later it was acquired by Blue Bus of Horwich, and later still was converted to open top and used as part of the City Sightseeing fleet, in Florence (Firenze) and then Cambridge, Bath and Brighton. Another demonstrator went to Capital Citybus for about six months, from June 1995. They put it into full Capital Citybus livery, and numbered it 300. It too went to Blue Bus, and then as an open-topper to City Sightseeing in Cambridge and then Brighton. Harris of Grays was a coach operator that had for some years run some bus services in the Thurrock area using secondhand buses, in a blue and cream livery reminiscent of Birmingham Corporation: from where many of the buses came. The opening of the Lakeside shopping pit in Thurrock gave a significant business opportunity. The 383 from Chadwell St.Mary was operated commercially, and Harris opened up four routes via the Dartford crossing into North Kent which were very successful. 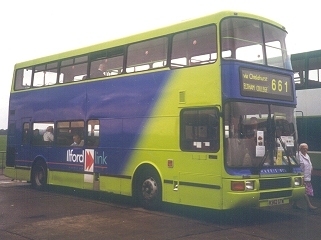 These prompted the leasing in 1996 of three DAFs with Northern Counties Palatine II single - doorway bodies, which were given an eye-catching livery of pale green and blue with LakesideLink branding. Two (317 and 318) were new, while the third (319) was an ex-demonstrator that had previously been with Bee-Line. The opportunity was taken to bid for the 661 schooldays -only service from Eltham College to Chislehurst and Petts Wood, using 319 as the regular bus between Lakeside trips. The change was not appreciated by the young people, who soon noticed that the Harris bus was not always ready waiting for them in the afternoon as the Stagecoach Selkent bus had been, and patronage fell quickly as they found more reliable ways to get home. The bus for the 661, along with Excels for the 108 service through the Blackwall Tunnel, was outstationed at a depot in Crayford. Apparent success with London tendering saw Harris bid successfully for more routes in 1997. Three routes in the Ilford area required a fleet of modern double-deckers, and Harris leased twenty-two Volvo Olympians and three more DAF DB250s, this time with dual doorways. These were also given the green and blue livery, but were branded Ilford Link for the 128, 129 and 150. They operated out of the main base at Thurrock. Two more DAFs (381 and 382) followed in 1998. 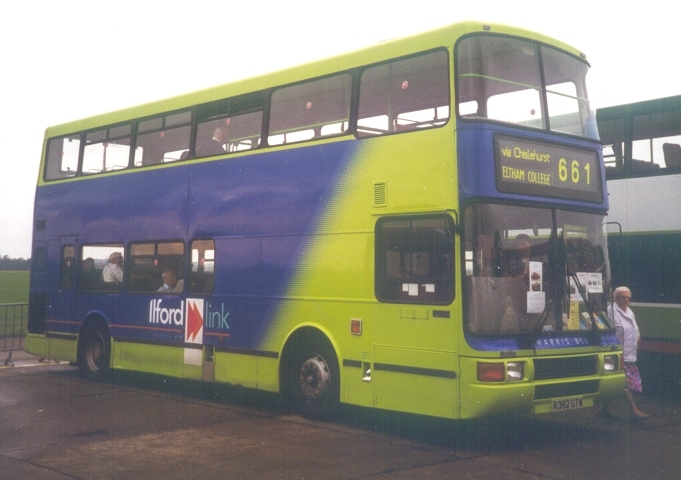 382 visited Showbus at Duxford in September 1998, wearing blinds for schools service 661. But Harris Bus had underestimated the costs of operating their London tendered services, with leased new buses, unsocial hours working and other costs not met in their commercial operations. In early 2000 Harris Bus went into administration. No other business could be found to take on the contracts, indicating that Harris had underbid rather than been profligate in their operation: no-one else could see a way of making these contracts work at the price either! So Transport for London had to take on their operation themselves, using their "operator of last resort" powers. East Thames Buses was set up as a London Buses subsidiary, partly with the aim of showing other operators how it should be done. They took over the Harris Bus vehicles, staff and London tendered routes, and reopened the mothballed Ash Grove Garage for the Ilford operations. The DAFs were among the vehicles transferred. But ETB's remit was only for the tendered routes. The single-doorway DAFs (317-319) were redundant, as their commercial Lakeside link routes were abandoned. All three were returned to dealer white. While their return off-lease was negotiated, 317 and 318 were used as trainers, but this was not a use to which expensive leased buses could be used for long. These two were replaced by much cheaper Metrobuses (which took their numbers), and were returned to dealers, who promptly sent them north to Manchester. But the remaining DAFs were now very much a minority type. They too were repainted in ETB red, and continued in service from Ash Grove for another two and a half years, until September 2002. Then all five dual-doorway buses were transferred to Belvedere, and were used to provide peak-hour extras on route 53. By now low-floor double-deckers were entering service, and East Thames Buses were keen to re-equip. The five were returned to Ash Grove in November for a last fling on Ilford services, but the reprieve was short: in December they were returned off lease, moving on to a variety of operators. One of the ex-ETB DAFs found itself with Flights Hallmark at New Haw, and was taken over by next-door neighbour Wiltax in June 2007. 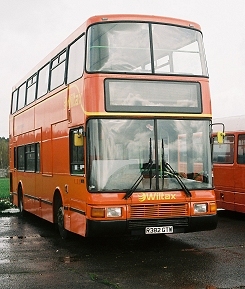 Wiltax, by then part of the T-GM group was taken over by Arriva later in the same year. 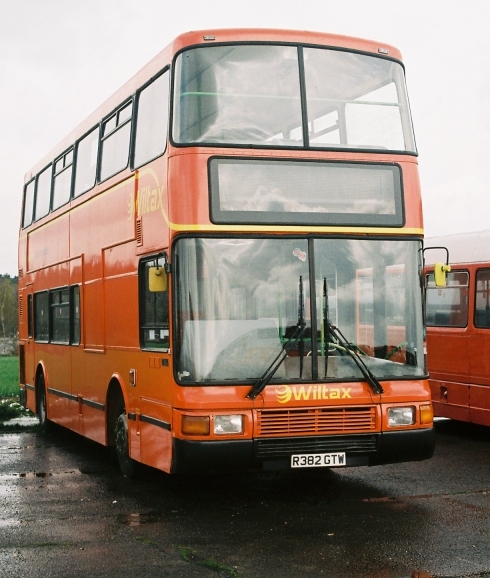 At first they allowed Wiltax to continue as it was, and 382 found itself repainted in Wiltax' vivid orange livery. Its work was mainly contracts, and it was used on a variety: the Brockham Bonfire specials, and Rail Replacement kept it busy during the winter. But its appearance at Cobham Museum Open Day at Wisley in April 2008 was a swan-song for Wiltax. Arriva closed it down later in April, and orange 382 found itself transferred to Network Colchester. 382 became a rail replacement and contracts bus for Wiltax of New Haw, and paid a visit to Cobham Museum Open Day at Wisley in April 2008.